If you haven’t read the first article in this series (“How to Avoid Temple Burnout, Part 1”), you might want to check it out for some essential background. Click here to read it. Now that we have some tools that will allow us to put what we are seeing into context – that is, we have a larger view of Japanese Buddhist temples and the hows and whys of their layout – let’s head into the temple complexes and look more closely at some of the details. The first thing most encounter when visiting a temple is a gate – the entrance (or one of the entrances) into the complex. (This might be a good place to point out that Buddhist temples are entered by going through a gate, and a Shinto shrine is entered by passing under a torii. 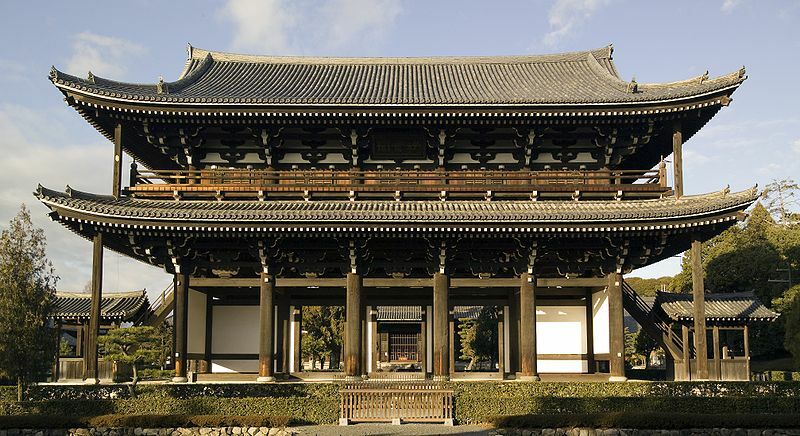 We’ll get into the subtleties of Shinto shrines and avoiding Burnout at them in a later article…) While it is normally no longer the case, during the Nara period (710 – 794 AD), temples complexes were built with a wall surrounding them. This wall extended east and west from the main gate – which generally faces south (an exception to this are Pure Land temples, which have their main gates facing east). Appropriately enough, these gates were called nanmon or nandaimon (“South Gate” or “South Main Gate”). This nanmon eventually became the Sanmon (more discussion on the meaning of this in a moment). As temples evolved over time, additional gates were added within the inner precincts of the complex, and one of these – found along the sandou (the approach/entrance path to the temple) and leading into the heart of the temple – was the chuumon (the “central gate”). In later periods, this gate is often found in the form of a Niou-mon (“Deva Kings gate”). 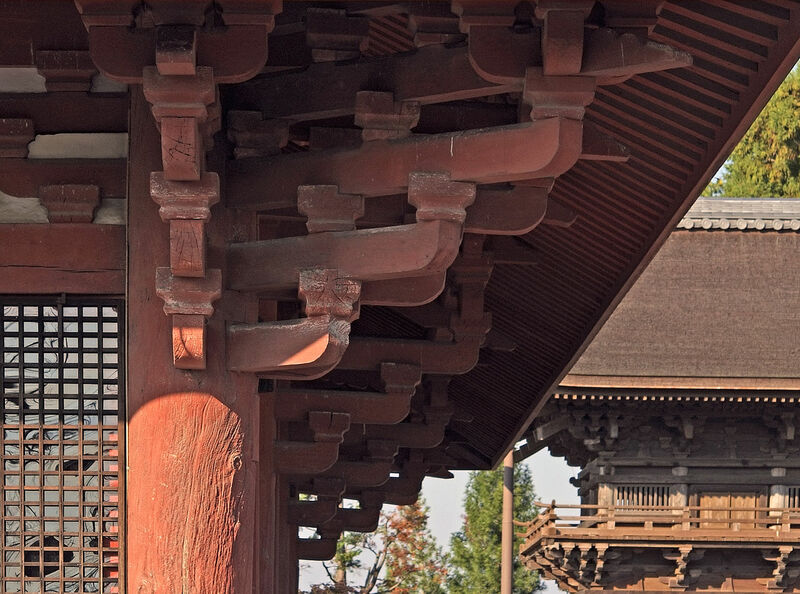 The Sanmon and the Niou-mon are two of the three primary gate styles found in a temple, and in addition to their physical roles in the temple’s layout, they also have considerable symbolic importance as well. Before moving on to discussing each in more detail, the third gate style must be mentioned (you didn’t think I’d leave that out, did you?). The chokushi-mon (the “Imperial Envoy’s gate”) was, as the name suggests, a gate whose use was reserved for visits by Imperial envoys or other high ranking officials of the court. If they are present, they are not used or open to the public. While all are welcome to enter and follow the path of Buddhism, a temple’s gates mark the division between the everyday world and the enlightened world of the Buddha. It is only fitting, then, that a temple’s gates are solemn and made a bit difficult to enter to ensure that people are put into the right frame of mind. The stone step running under the gate and the columns dividing it are physical symbols of the division between the two worlds. The “San” in sanmon is a homonym for two very different gates. 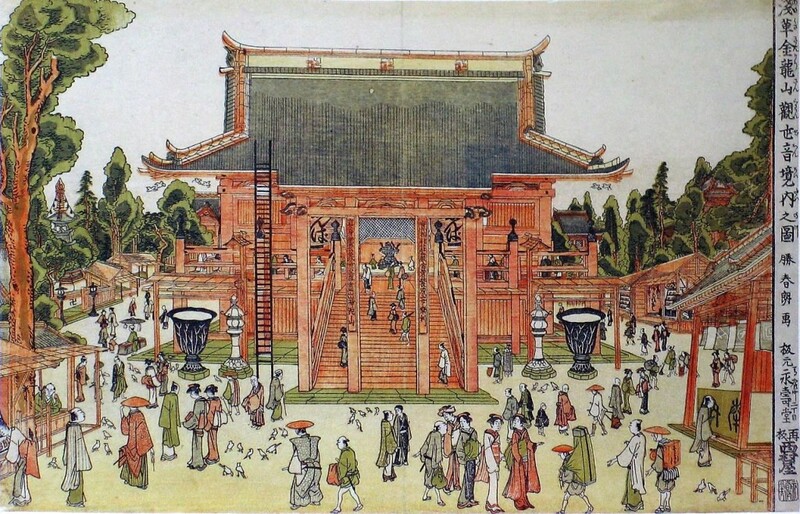 The first is for SANgedatsu-mon (the “gate of liberation from (three) earthly desires”), and in this case, the gate will be built so that there are three entrances in it. By passing through this gate, one can be emancipated from the three passions of 1) Avarice, 2) Anger, and 3) Ignorance through the study of Buddhism. The three portals are also analogous to the paths needed be liberated from the world of illusion: 1) musou (“emptiness” or self-lessness), 2) musou (“formlessness”) and 3) mugan (“desirelessness”). In the second case, san means “mountain” and is a reference to the temple’s Buddhist name. This custom originated in China, and show that temples were built in mountains. It is used even for temples that are built in urban areas or flat lands indicating that while physically not in mountains, temples are still separate from worldly or earthly. This “mountain gate” will often have the temple’s “mountain name” written in a frame and hung from the gate. Walking along the sandou after passing through the sanmon, the next gate encountered is the Niou-mon (“Benevolent / Deva Kings gate”). 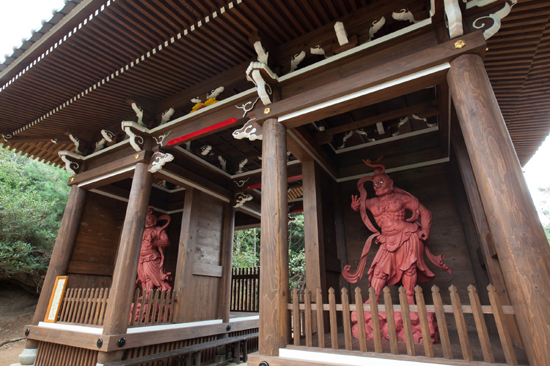 This gate houses the guardians that protect the temple from evil spirits and thieves – fierce of expression and wielding weapons. These Devas are also bodhisattvas who act as the Buddha’s bodyguards. Niou-mon will also often have a pair of enormous woven straw sandals hanging on the reverse side of the gate – these are also to ward off demons, their sheer size being to intimidate those who would mean harm from coming further. 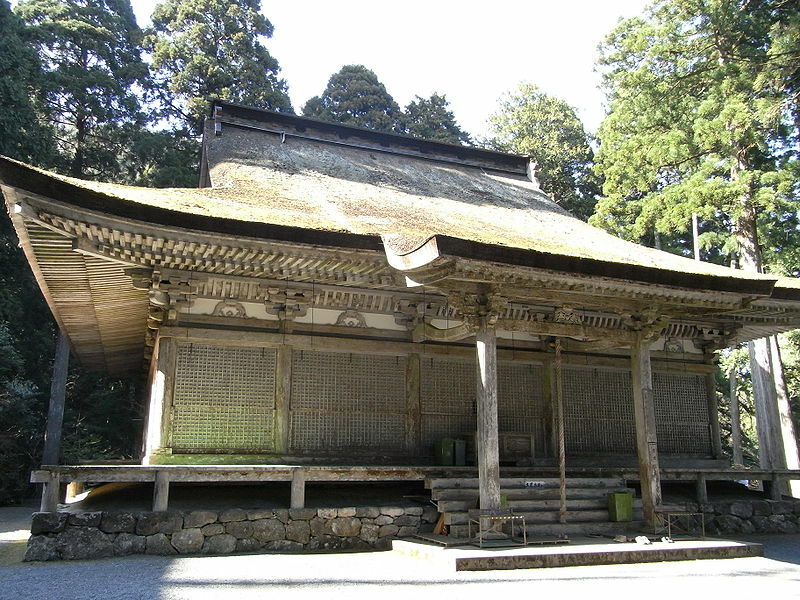 Although the Hondou (the Main Hall) has become the center of a typical Japanese Buddhist temple, this position was originally held by the pagoda. The pagoda is the origin of all Buddhist buildings and is the emblematic building of the Buddha. They take their form from the Indian stupa – hemispherical buildings made of brick and mud – and in which the bones of the Buddha were interred. Later, the bones of Buddhist monks came to be interred in stupas. As Buddhism spread from central Asia and into China, the stupa merged with the Chinese roukaku (multi-storied construction) style to become multi-tiered towers – the three, five, and seven story pagodas. In Japan, there are four types of pagodas: 1) the three story, 2) the five story, 3) the “thirteen story” (any pagoda with more than 10 tiers/stories is called a “thirteen story pagoda”), and 4) the tahoutou (“many jeweled pagoda”) – a two story square or round building with a domed roof and a large room enshrining a statue of the Buddha on the first floor as characteristics. 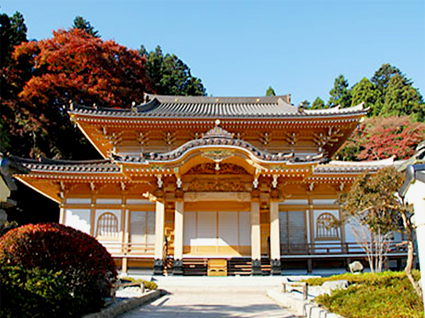 The three- and five-story pagoda are the most commonly seen in Japan. There are no longer any seven or nine story pagodas existent, but there is one 13 story pagoda – found at Tanzan Shrine (formerly also Tonomine temple, until the forced separation of Buddhism and Shinto in 1869, but we’ll talk about that in another article when discussing how to avoid Shrine burnout, ok?) in Nara. Pagodas are fundamentally composed of the sourin (the finial- or decorative spire – at the top of the structure), the roof, the tower itself, and the base. All pagodas are topped with a sourin, and this finial is not only a defining characteristic, but the most important portion of the pagoda. 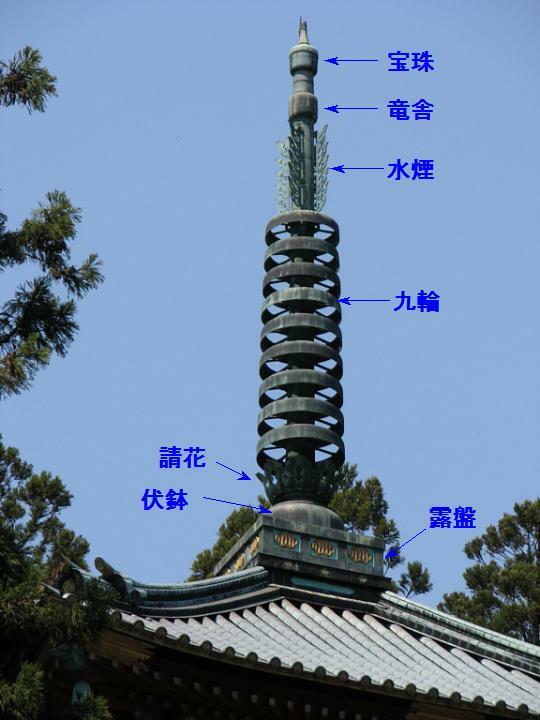 In fact, the “jewel” (houju) at the very tip of the finial, is where the Buddha’s bones or other relic (ashes, finger nails, etc.) are kept and so represent the heart of the pagoda. Below the houju is a cylinder called the ryuusha (the “dragon vehicle” or vehicle of nobles). Beneath that is the suien (“water smoke”), a series of vanes set purpendicular to each other and designed to look like flames. The purpose of the suien is to ward off and prevent fires. The kurin (“nine rings”) or hourin (“jewel rings”) comes next, and is a series of nine rings encircling the central pole of the finial. These nine rings are symbolic of the five Buddhas and four Bodhisattvas. A decorative base, usually in the design of eight upturned lotus petals, called the ukebana, is just below the kurin, and below that the entire sourin is supported by fukubachi (an inverted bowl shaped stone) and roban (“dew basin”), which acts as the foundation and connects the sourin to the roof. Pagodas are meant to be viewed/worshipped from the outside. This doesn’t mean that there is nothing in the interior of the structures, though. Far from it. The interior of the pagoda is “Buddha’s world” and as such is richly decorated – the columns and ceiling are covered with images of the world of the Buddha, and there are generally statues of the Buddhas enshrined within them as well. On the ground level, there are statues of four Buddhas riding animals (Ashuku Nyorai, associated with the east and riding an elephant; Houshou Nyorai, south, riding a horse; Amida Nyorai, west, on a peacock; Fukujouju Nyorai, north, riding a garuda). These four Buddhas surround and protect the Dainichi Nyorai, sometimes shown riding a lion, and whose statue is placed at the highest floor of the pagoda. Together the five Buddhas symbolize the five wisdoms – wisdom against anger, desire, envy, ignorance, and pride. 4) Secchuuyou – A pattern based on the previous three, appearing in the late Kamakura period. Although the wayou style was introduced in the Askua period, it was during the Heian era (794 – 1185 AD) that the style was refined and it wasn’t until the Kamakura that structures built in this style began to be called wayou to contrast them to the daibutsuyou and zenshuyou styles that were beginning to be brought from China at the time. 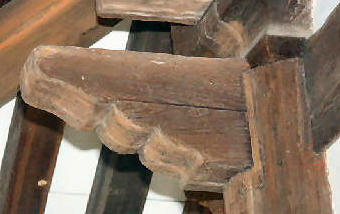 The second characteristic is the renji-mado (“lattice-work window”), a window with bars (diamond-shaped if seen in cross section) placed vertically at fixed distances in it. If a building has renji-mado, it is almost always wayou. The only exception to this is the Secchuuyou, which also uses renji-mado. Daibutsuyou as a style was in use for only a very limited time – from about 1180 AD until shortly past 1206 AD – and was brought to Japan by the monk Chogen. Daibutsuyou uses the minimum amount of materials to make large buildings that give the viewer an impression of strength and power. 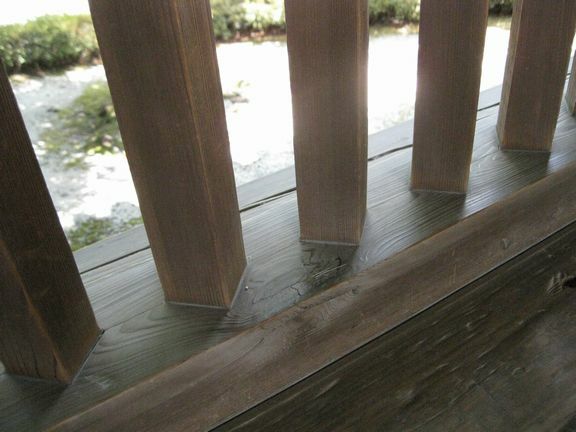 A feature particular to daibutsuyou is the use of sashi-hijiki: an elbow or bracket (an “ancon” in architectural terms, if you want to technical about it, but since this isn’t a technical journal, we will simply point this out before moving on…) that is inserted directly into the supporting columns. Sashi-hijiki are often stacked atop one another, and the are used to spread the load of the roof over a wider area and support the eaves. 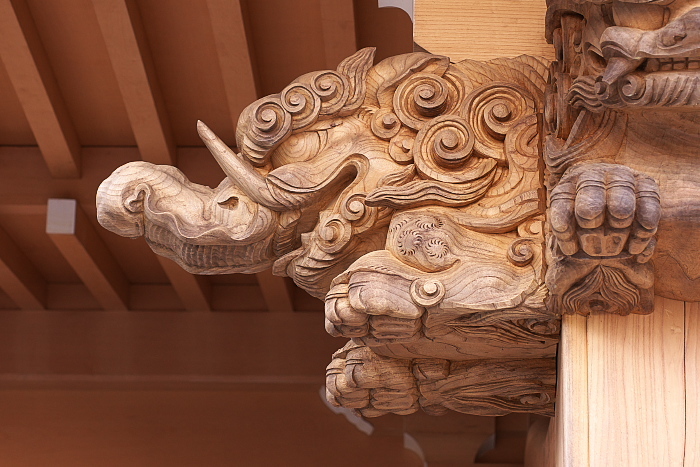 Another feature of daibutsuyou are kurikata, decorative carvings that extend from the ends of the beams that are inserted through the columns of the building. At first, these kurikata were simply repeating curves or arcs, but later, they became more elaborate, taking the form of animals like lions and dragons. Like daibutsuyou, zenshuuyou was brought from China. It spread along with the introduction of Zen in the early Kamakura period, and originally aimed to copy the Chinese style of construction. It is sometimes known as karayou (“Chinese style”). Although simple, zenshuuyou is characterized by richly expressed ornamentation. One of the most obvious features of the zenshuuyou style Main Hall is its roof – the edges of the eaves curve out in a dramatic flair. Another is the use of tsumegumi (called “dougong” in Chinese; a cap & block system of support brackets). 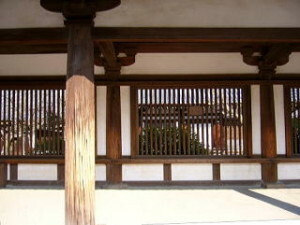 Zenshuuyou uses these decorative elements, normally found at the top of columns, in a line between the columns that support the roof. Like the kurikata of the daibutsuyou style, zenshuuyou uses kibana (“wooden nose”, an architrave), a horizontal beam whose ends have been carved into ornamentation – often shishi (lion-dogs), elephants, and spirals. The fourth style – Secchuuyou– is a pattern based on wayou that has adopted traits of both daibutsuyou and zenshuuyou. The style developed during the Kamakura period, with it first appearing as shin-wayou (“new Japanese style”) at the start of the era, and then in the late Kamaura period, shin-wayou merged with zenshuuyou to form the sechuuyou style. Because it is a blend of two previous styles, it has characteristics of both – like wayou, it employs renji-mado (lattice-work windows) and from zenshuuyou, it uses decorative kibana beams. The most important thing to remember about the secchuyou style is this: after the late Kamakura period, this style becomes the mainstream style for Japanese temples. 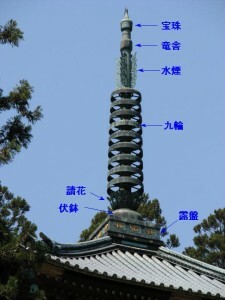 This means that most of the temples you will see in Tokyo are probably going to be secchuuyou style temples. 1) Kirizumazukuri – two sloping faces dropping down from the roof’s ridge pole, like a book opening downward, making a mountain peak. 2) Yosemunezukuri – four sloping faces dropping down from the points at either end of the ridge pole. 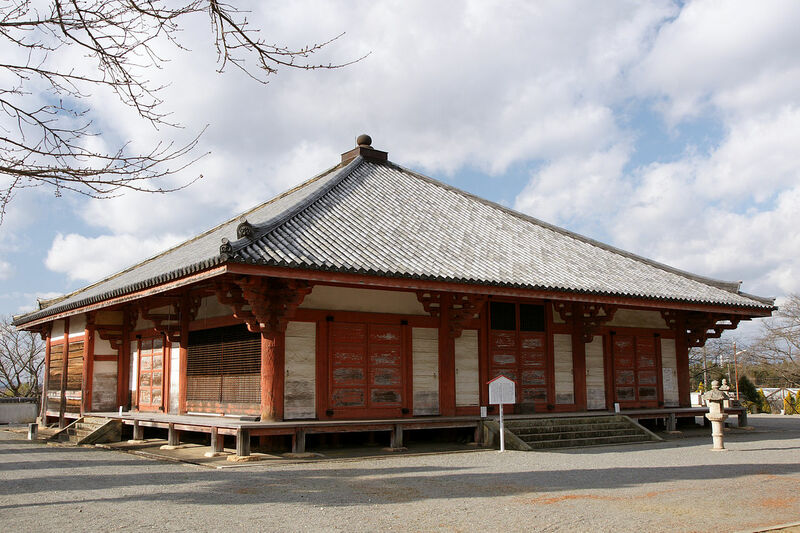 3) Irimoyazukuri – Hip-and-gable roof. This is a blend of the previous two styles. 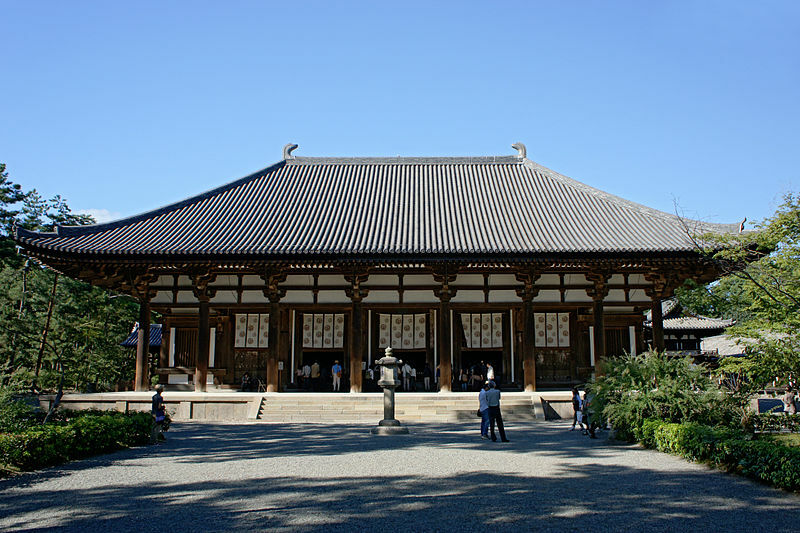 It would make things a bit simpler if the temple building styles incorporated only one type of roof (say, wayou style only using yosemunezukuri), but you will find different roof types on building styles. However, as a rule, temple roofs are almost always made of tile. The exception to this is zenshuuyou, in which roofing is overwhelmingly made of cypress shingles (there are a few rare examples of zenshuuyou temples having tile roofs, though). 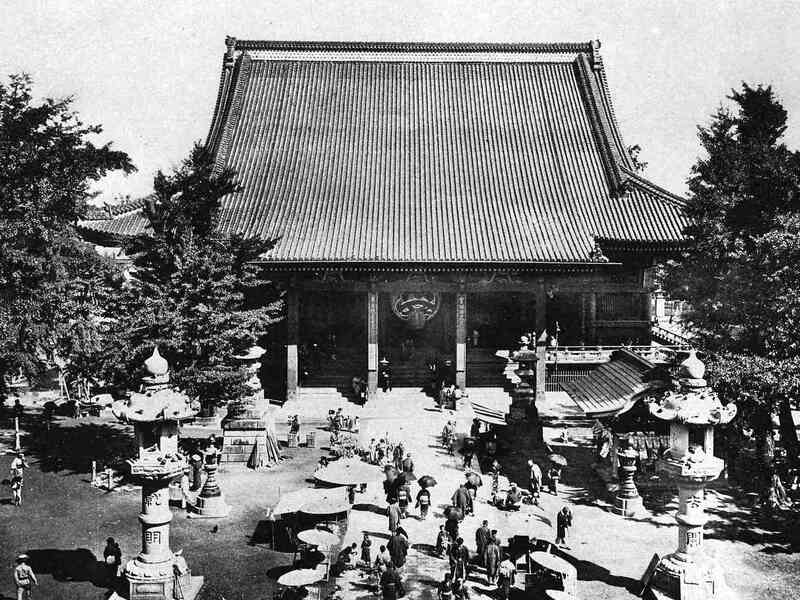 Unlike the first article in this series, which gave you the fundamentals that allow you to put a Japanese Buddhist temple into context and get an understanding of what you are seeing, this article dives deeper and see a temple’s buildings with a finer eye and appreciate their details. You will now be able to see decode a temple’s layout, its buildings and structural details, which will not only keep every temple visit fresh and new, but also astonish your friends and family as you point out the nuances of any Japanese temple. Best of all you will never suffer from Temple (or Shrine!) Burnout again. There are two types of gates that you will encounter most often: the Sanmon and the Niou-mon. The first divides the common world from the enlightened world, and the second keeps demons out and scares pilgrims into the right frame of mind. The pagoda is one of the most important structures in a temple, and the most important part of a pagoda is the bit at the very top. They are meant to be worshiped from the outside, but the inside is richly decorated (just don’t expect to be able to visit it). 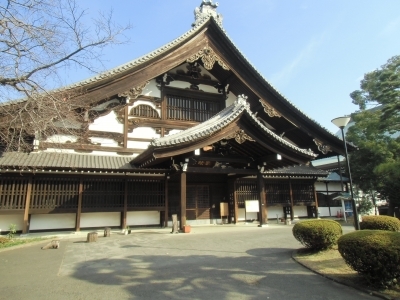 The Main Hall is now the center of the temple complex and the style in which it was built will tell you the era of its construction as well as the sect (zenshuuyou). 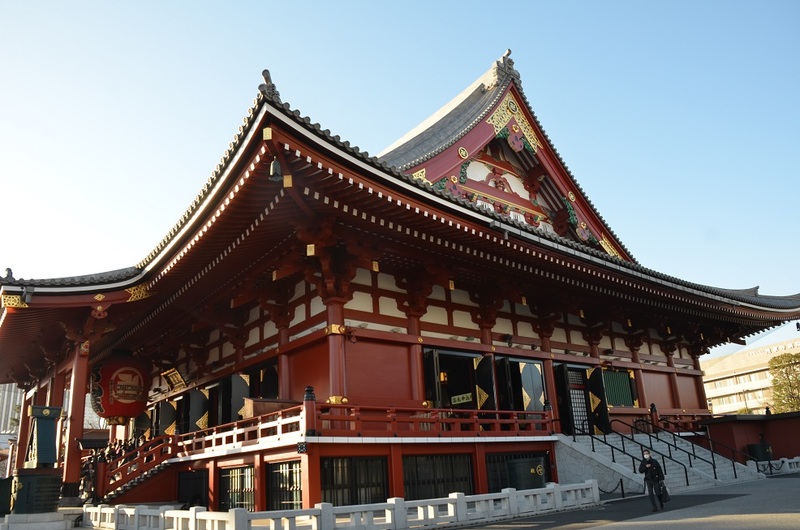 Most temples that you will visit will likely be secchuuyou style. Temple roofs are almost always tile, but zenshuuyou temples (that is, Zen temples) will predominantly be roofed in cypress shingles.